I have something to confess: I thought that, when we visited the village of Patterdale in the Lake District (where patterdales originated), it would be like Disneyland for patterdale terrier owners. I really did. So Michael and I booked a weekend in a cosy dog-friendly inn and took Bruce, our patterdale mix, on holiday to see the sights. On the journey, I imagined patterdales of all shapes and sizes dragging their owners down the main street of the village, the tips of their ears meeting on the top of their heads from sheer determination to reach the next bottom for a sniff. I was convinced I’d see ridiculous people wearing patterdale dog costumes beckoning us into dog-friendly shops, where rows of patterdale paraphernalia would gleam on the shelves. Stuff you’d never need but somehow have to have. Pat the patterdale mascot would wave at us across the street and urge us to enter a Ripley’s weird and wonderful museum of all things patterdale. I pictured myself spoilt for choice in the bijou gift shops, as I debated over an Abigail Ahern-esque patterdale lamp and a large white candle carved into the shape of my favourite breed, before deciding there was definitely room in my life for both. If the worst came to the worst, I thought, I would settle for one of those bizarre mugs where the head and tail wrap around the mug to make a handle. Maybe even a fridge magnet. 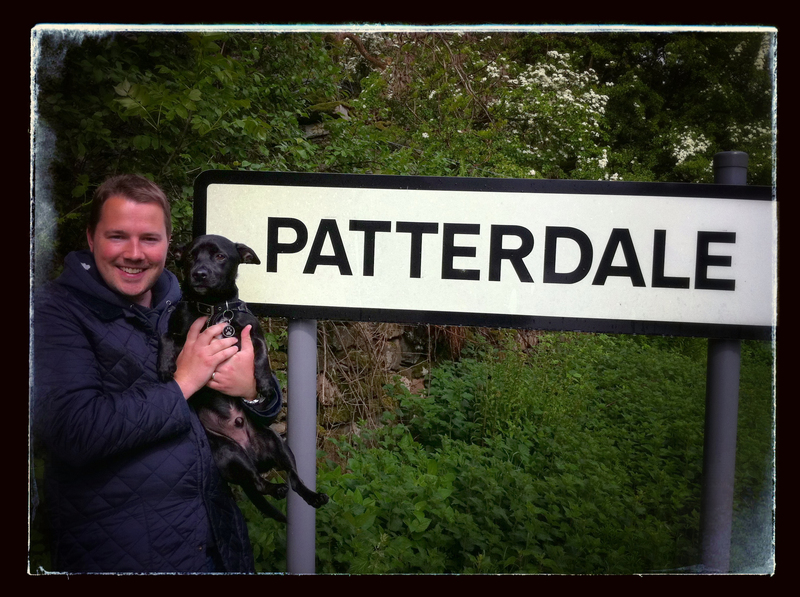 I just knew Bruce would love Patterdale too. A village full of Bruce lookalikes. He could have a good sniff, investigate lamp posts sprinkled with genuine patterdale pee and make important comparisons. He could maybe learn a thing or two from some of the more polite patterdales walking the main strip. I could be terribly proud of Bruce’s coat and how shiny it is. I could talk to other crazy dog ladies about the little tricks and characteristics of the breed and the individual personalities of our little friends. 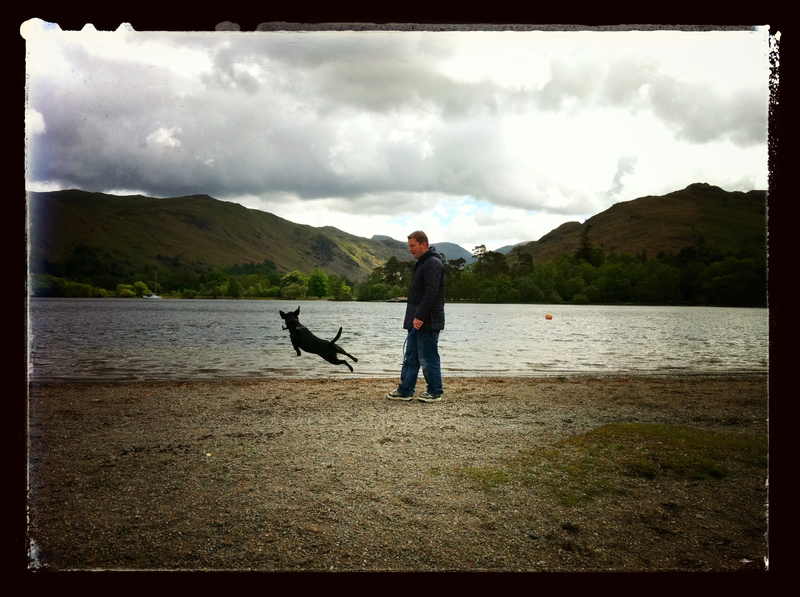 I would be in patterdale heaven. Or so I thought. In reality, I went to Patterdale and I didn’t even come back with a ‘lousy t-shirt’. As pretty a village as it is (and it really is! ), nestled in the glorious scenery of the Lake District, all I could find to bring home was the Patterdale village sign. And as that seemed to be stuck fast in the ground, I had to settle for a photo of that. Disneyland for patterdales … what was I thinking?! Final, more serious note: Despite the lack of patterdale gift shops etc. etc., we’ll definitely be back to the area. What a beautiful part of the world – highly recommended for a relaxing, scenic holiday with plenty of great walks for dogs.